As a new designer and business owner, balancing creative direction, production and business procedures can be overwhelming, especially when it comes time to source fabrics for your line. That’s why we’ve created this guide to help you better understand the do’s and don’ts of sourcing fabrics. Creating a clothing line is so much more than a hobby; it’s a business. Whether your line is a personal project or the next Balenciaga, attention to detail is paramount every step of the way. From tech packs to licensing and everything in between, there’s a lot that goes into a clothing line behind the scenes. Download the production checklist we use with all of our clients for everything you’ll need – and we’ll throw in our costing template, fabric & trim directory, and development cheatsheet too. Even if you don’t plan on selling your line to the public, efficiency at ever turn can save you a lot of time and money. This is especially true of sourcing, which can be a complex process with multiple variables including vendors, shipping, timelines, and more; the materials you use can make or break your line, so as difficult as it might be, it’s important to find suppliers that meet your needs. What season is your line designed for? Are you working on an F/W line or creating a lighter collection for spring/summer? This will help you decide on the fabrics and materials you’ll need. What is the purpose of your collection? Whether it’s a small-scale collection for retail or a runway line for a fashion show, the purpose of your collection helps determine things like functionality, rigidity, and durability, which are essential to the proper execution of your design. What type of garment are you creating? Consider what type of garment you’re making before determining the right fabric. Undergarments are often made with breathable fabrics like cotton or even modal which have high absorption. While Polyester fabrics don’t have great breathability, they are often wrinkle much less than natural fibers making them great for many contemporary items that lay loosely on the body. Understanding each fabric and it’s properties in relationship to the garment you’re making allows you to ensure you’re picking the right material for the job. Once you’ve decided on the materials you need, you should establish a plan for the execution. Doing so will allow you to streamline your operation, resulting in a more efficient and affordable execution of your collection. How are you going to use the materials? Whether you’re ordering 5 square feet for trim or 500 square feet for the bulk of your design, you should have a plan for how you’re going to use all of the material to avoid any waste. Are you going to dye/treat the materials? Many suppliers offer pre-treated or dyed materials, but what if they don’t have the finish you’re looking for? It’s important to decide whether or not you’re going to alter your materials as some suppliers may be able to do it for you. How much do you need? Determining how much material you’re going to need can help you narrow down your choices in the beginning and save you time and money in the long run. More fabric will bring down the price, but you risk extra inventory. It’s important to know how much you need so that you can confirm that a supplier is able to fulfill your order. 1. Lead Times or In stock fabrics available? Now that you’ve figured out what you need from a design perspective, it’s time to find a supplier that can meet your needs. This can be tough since many suppliers have very high minimum order quantities, which isn’t ideal if you’re working on a small collection. Here are a few questions you can ask to hone in on the perfect supplier. Agents/sales reps: Agents have access to networks of suppliers, and can help you source materials and producers for a fee. This is usually the most expensive option, and you may be required to place a large order. Trade shows: Trade shows allow you to develop personal relationships with suppliers, and give you the opportunity to view their products up close. Online: Shopping online for materials can be hit or miss, but it’s possible to find amazing materials without even leaving your couch. Just make sure that you know exactly what you are ordering. Converter: A company that buys materials directly from fabric mills, then treats or alters them into a full line of finished fabrics. They are a great choice for trendy and “in” materials, and often have low minimum order sizes. 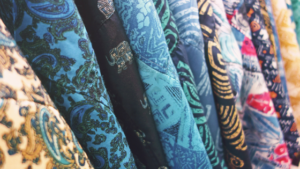 Jobber: Jobbers buy large quantities fabric from mills, converters, and design businesses, then resell them to smaller design companies and manufacturers at wholesale prices. This allows for lower minimums but a constantly rotating stock. Mills: Most mills and larger suppliers don’t have website or customer-facing contact information since they usually deal with businesses. If you manage to touch base with a mill with the materials you need, be prepared to make a large order. 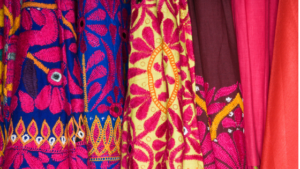 Full-Service Development Shop: Full-service development shops (like Indie Source) have established relationships with different suppliers and can cut down on the time needed to source the best fabrics for you. Their consultative approach won’t be as cheap as doing it yourself unless you factor in the time saved and stress avoided. There’s a lot to sourcing fabrics, and it’s just one part of the development process. Download the production checklist we use with all of our clients to see everything you’ll need to get started – and we’ll throw in our costing template, fabric & trim directory, and development cheatsheet too.